ATLANTA (March 16, 2015) – Chick-fil-A® introduces its newest menu item, Frosted Lemonade, at restaurants nationwide today. The refreshing treat combines two of the fast food restaurant’s most beloved offerings, Chick-fil-A Lemonade and its signature Icedream®. The new menu item was long rumored as a recipe created by Chick-fil-A team members to enjoy while on breaks. 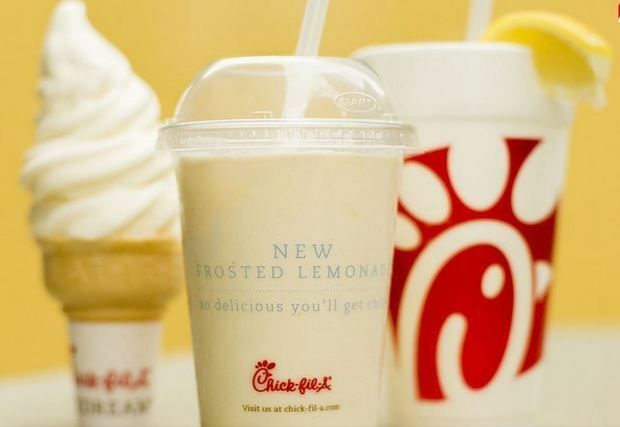 After hearing stories of the creative concoction, Chick-fil-A refined the Frosted Lemonade recipe and formally tested it in restaurants in Charleston, S.C., Raleigh, N.C., Sacramento, Calif., and N.W. Arkansas in spring of 2014. Positive customer feedback confirmed Chick-fil-A’s decision to launch the treat nationwide for customers seeking an on-the-go snack or an indulgence that is lighter than a milkshake. Chick-fil-A’s lemonade is made from scratch daily at each restaurant using only lemon juice, pure cane sugar and water. In 2014, Chick-fil-A served 121 million cups of lemonade and purchased approximately 250 million lemons. Icedream, inspired by founder Truett Cathy’s original recipe, is a soft serve ice cream with a simple, distinct vanilla flavor. Frosted Lemonade is available in a 16oz. serving with prices starting at $2.69 and can be handspun with diet or regular lemonade. Diet Frosted Lemonade (with Splenda®) has only 240 calories, while the regular Frosted Lemonade contains 330 calories. To follow what customers are saying about Frosted Lemonade, visit chickfila.tumblr.com, or search Instagram, Twitter, and Facebook using the hashtag #FrostedLemonade. Founded in the early 1960s by S. Truett Cathy, Chick-fil-A produced sales of nearly $6 billion in 2014, which marks 47 consecutive years of sales growth. Chick-fil-A was recognized in 2014 as one of America’s “Top 20 Most Admired Brands” by The Harris Poll, “Top Fast Food Chicken Chain” by Consumer Reports and the only restaurant named to 24/7 Wall Street’s “Customer Service Hall of Fame.” More information on Chick-fil-A is available on the chain’s website located at www.chick-fil-a.com.